Wigan have stood out all season as the most dominant team, so their return to the Championship isn’t much of a surprise. 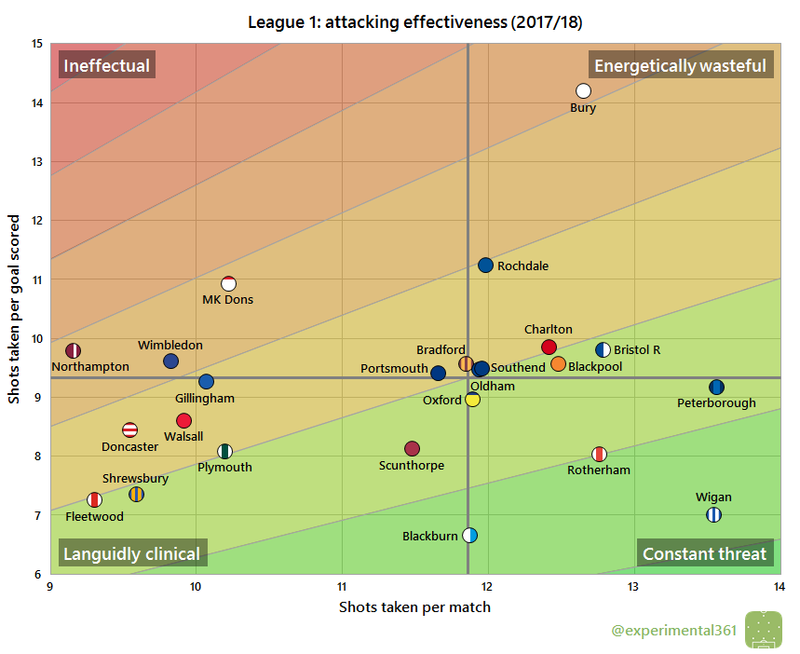 Peterborough are once again in the entertaining top right quadrant that they’ve made their own – they took almost as many shots as the Latics but allowed more than some relegated teams. Plymouth may have narrowly missed out on the play-offs but for much of the season their underlying numbers looked dreadful, hence them being stuck among the relegated teams here. Bury meanwhile looked relatively decent in raw shot terms, but we’ll see below how it went wrong for them. It’s interesting to see a huge gap between the nine teams on the left and the rest of the division on the right – without more data I’m not sure whether this is a tactical grouping between teams who look to out-create their opponents and those who prefer to play on the break. 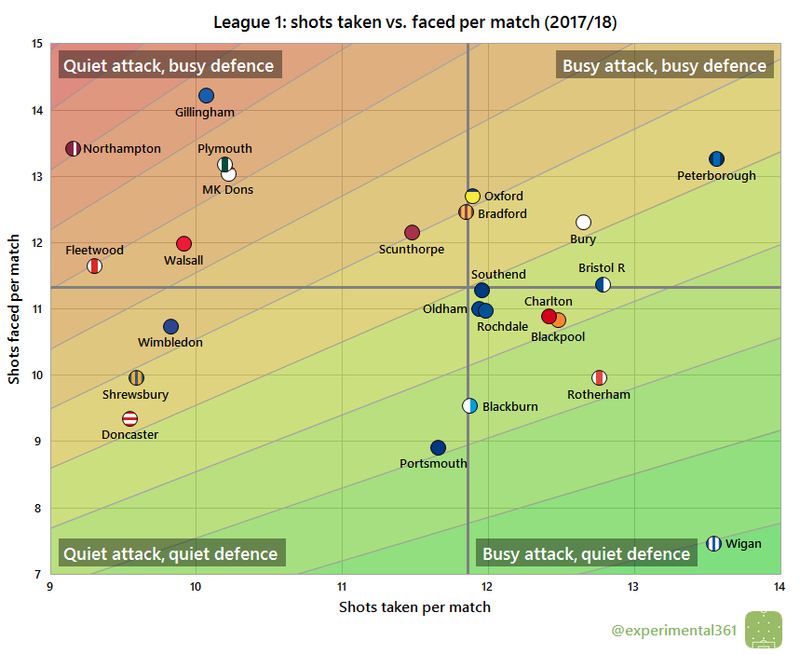 Bury‘s finishing played a huge part in their relegation: they may have taken comfortably more shots than the average team but they needed far more attempts than anyone else to find the net. Rochdale – who narrowly avoided the drop on the final day – look to have suffered from a less extreme version of the same problem. Blackburn meanwhile were the division’s most clinical finishers, which helped them to keep pace with a Wigan team that created far more chances. 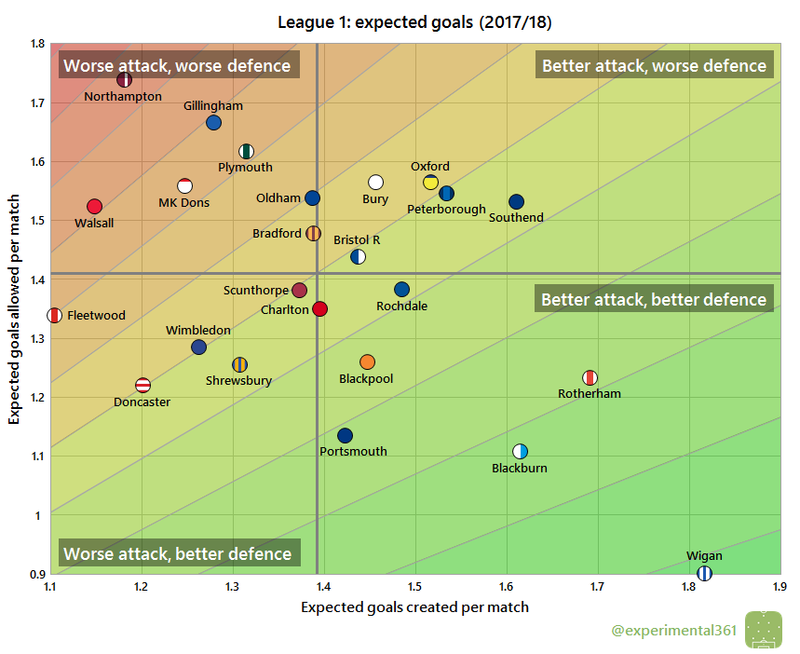 Gillingham look to have relied heavily on their defence this season, allowing the most chances in the division and soaking up more for each goal conceded than anyone else. Three of this season’s play-off challengers – Scunthorpe, Plymouth and Peterborough – also look to have successfully absorbed lots of shots. 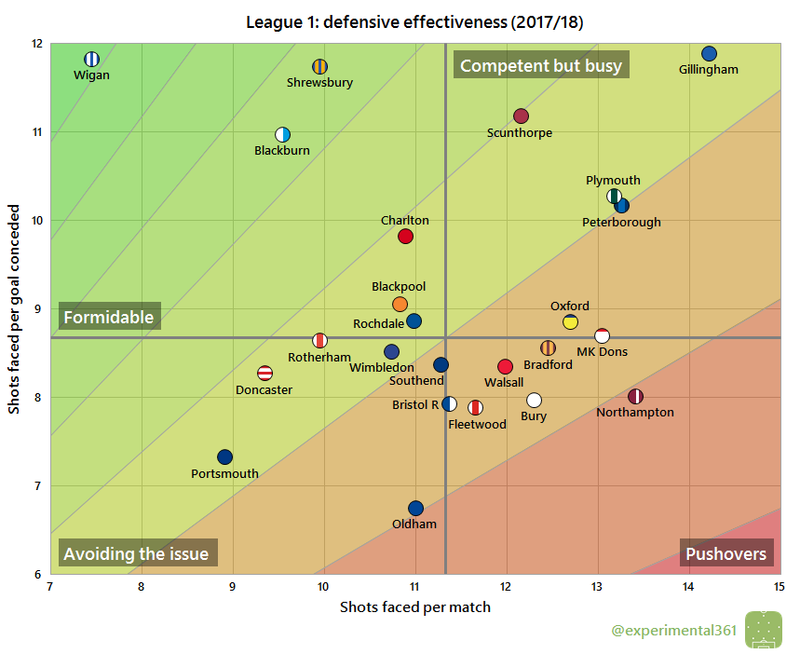 While Bury can blame their forwards’ poor finishing for their relegation, Oldham‘s problems look to have been in defence, where they repelled fewer shots for each goal conceded than anyone else. 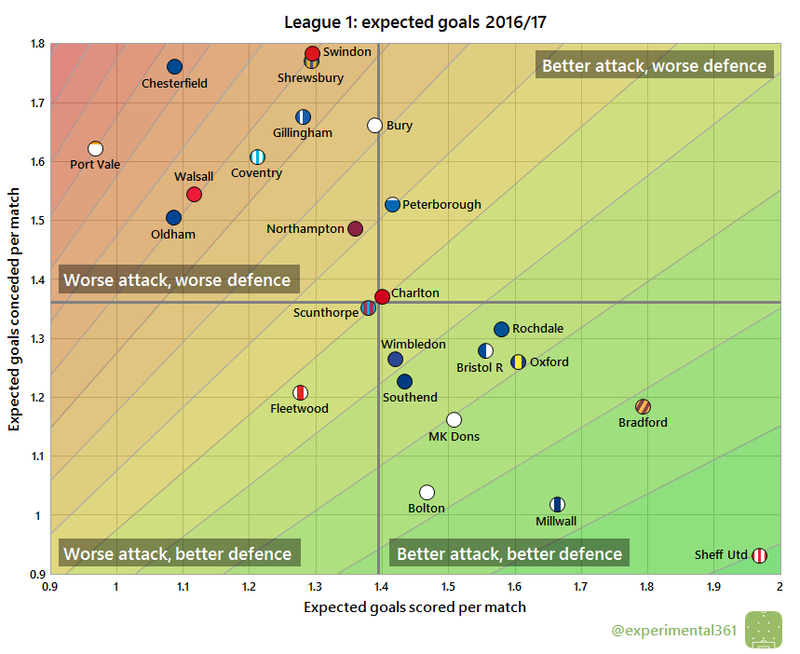 When we adjust for shot quality, three of the top four stand out, with Wigan again leading the way. Shrewsbury‘s brilliant season looks to have been a huge overachievement, although even in the data they’ve taken huge strides forward since last season. It’s been a strong return to the division for Blackpool and Portsmouth, while Rochdale looked good enough to have avoided that last-gasp relegation escape altogether.